The Magic Formula is a value investing strategy invented by the hedge fund manager Joel Greenblatt in the bestselling and highly recommended Little Book that Beats the Market. It focuses on finding quality value stocks using a blended ranking system (the Magic Formula rank) composed from two fundamental ratios: Return on Capital (which Greenblatt argues is the best determinant of whether a business is a good one) and Earnings Yield (his favoured measure for cheapness). He summarised his philosophy with the maxim "buying cheap stocks at bargain prices is the secret to making lots of money". In the fourth edition of his book Greenblatt claimed the top scoring portfolio of 30 stocks appreciated by 30.8% each year over the previous 17 years, though he stressed that the strategy could underperform during periods of up to two years. Having now sold hundreds of thousands of copies, the "Magic Formula" is credited for reinvigorating the practice of value investing. Value Investor, founder of Gotham Capital and the Value Investors Club. Author of The Little Book that Beats the Market. 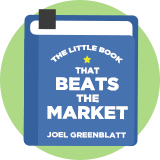 In his best-selling "The Little Book that Beats the Market", Greenblatt espouses MFI as a do-it-yourself version of the approach he used at his fund Gotham Capital (which apparently returned over 40% annualized from 1985 to 2005).